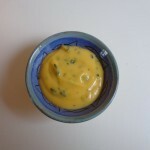 Béarnaise sauce is a tangier relative of the more frequently seen hollandaise and may be served alongside meat, fish and vegetables to great effect. It doesn’t take long to make, but needs a bit of technique. Overheating spells disaster — the béarnaise will curdle. But if you take your time, you will end up with a beautiful satiny sauce that has been one of the glories of the French table since it was first created almost 200 years ago. This recipe makes enough sauce to serve 6 generously. Success requires a double boiler. The béarnaise may be made in advance and gently reheated (see below). In a bowl, beat the yolks with a wire whisk until light. Peel and mince the shallot. If using fresh tarragon, remove the leaves from the sprig and chop finely. This should make about one tablespoon. Put about an inch (2.5 cm) of water into the bottom of the double boiler and bring to a simmer over medium-high heat. In a separate small saucepan, combine the wine, vinegar and shallots and boil down until the mixture reduces to about 2 tablespoons — this takes about 3 minutes. Strain through a sieve into the top of the double boiler, thus removing the shallots. Add the lemon juice. Turn the heat down to low under the bottom of the double boiler. Place the top half with the wine-vinegar reduction over the warm water. Add the butter and stir until it melts. Add the egg yolks, stirring constantly until the sauce starts to thicken. This is the time to be careful — if you go too fast, the sauce can turn into scrambled eggs! The best method I’ve found is to remove the top half of the double boiler from the heat once the sauce reaches the consistency of thick heavy cream. Continue stirring off the heat, and it will soon reach the consistency of mayonnaise, which is what you want. Now add the tarragon, salt and pepper. Serve warm. Béarnaise sauce may be made ahead of time and reheated. Simply leave it in the top half of the double boiler, off the heat. When nearly ready to serve place it back over the bottom half of the double boiler, filled with water that is warm but not simmering. Be careful: if the water is too hot, the sauce will separate.